The Minister of State for Transport, Jesse Norman MP, visited Hereford on Friday (25 January) where he lauded the benefits of an additional £5.108 million Department for Transport investment, which is already improving roads across the county. The money will allow the council, working in partnership with Balfour Beatty Living Places, to improve the condition of more than 50 B, C and U class roads in the county. The Minister’s visit began with a presentation delivered by Cabinet member transport and regulatory services, Cllr Barry Durkin and the council’s head of highways, Clive Hall, at the highways depot in Rotherwas. The presentation outlined how the additional £5.108 million is being invested, along with an explanation of Herefordshire’s sector-leading asset management systems and infrastructure. The group was then shown how state-of-the-art technology is being used by Herefordshire Council and BBLP to deliver road improvements in the county, including a demonstration of a sophisticated Velocity patcher at work. Finally, the Minister was shown the programme of repairs being carried out to one of the more than 50 B, C and U class roads that will benefit from the additional investment. Cllr Barry Durkin, Cabinet member transport and regulatory services, said: “We were delighted to welcome the Minister to Herefordshire, which is of course his home constituency, and update him on the council’s commitment to further improving the county as a great place to live, work, visit and study. 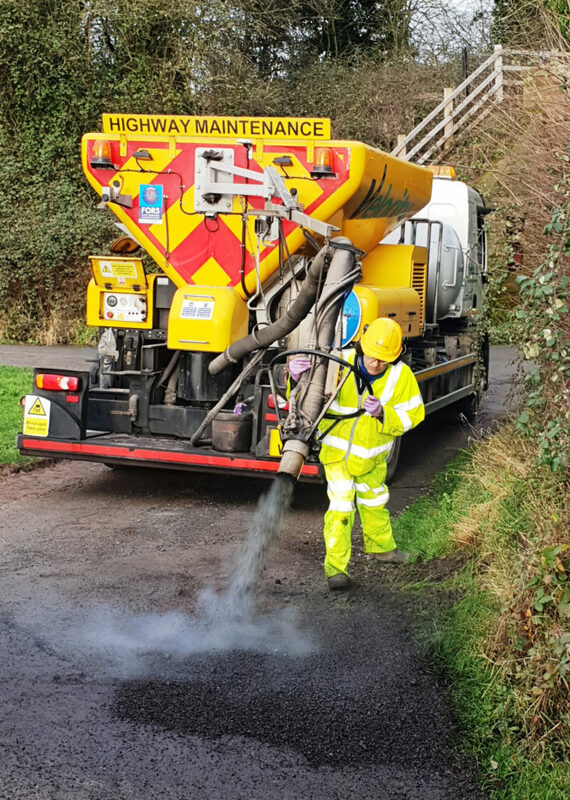 Velocity’s managing director, Dominic Gardner, said: “We are proud to be able to help local authorities get more value from their investment in highway maintenance, with our repairs costing a third of the price of traditional repairs. Each of our machines is capable of repairing up to 200 defects per day, keeping traffic moving. This entry was posted in Latest news by Velocity. Bookmark the permalink.